Whilst we were all enjoying the festivities, Nuart and world-renowned Australian artist Ian Strange have been busy with their latest public art installation of 2018. Out with the old advertising and in with the new art billboards are all part of Nuart’s strategy to reduce the gap between art and every day life. The art billboards are located in the ‘Art City’ of Stavanger, Norway, and have been designed by multidisciplinary artist Ian Strange, who first visited Stavanger in September 2017 to participate in the annual Nuart Festival. Located at the corner of Dalabrekkå & Østre Ring in the east part of the city, the billboards are installed on the same site where two commercial billboards stood for many years before being decommissioned in late 2016. Strange’s work explores architecture, space and the home, alongside broader themes of disenfranchisement within the urban environment. His practice includes large-scale multifaceted projects resulting in; photography, sculpture, installation, site-specific interventions, film works, documentary works and exhibitions. The images are taken from Strange’s ‘Target’ series of original artworks on found vintage photographs, which explores the cultural and social impact of Home in various cultures. Nuart is part of an international network of artists and activists that seek to raise awareness about outdoor advertising. 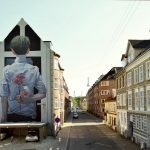 Nuart’s ‘art billboard’ project (there are now three in Stavanger) supplements various Nuart initiatives including artist residencies, workshops and events exploring key themes of art and public space.